This post is dedicated to all human beings who have less common sense than I. So far, I’ve found one. But not one to be easily deterred by a little foible like poor product placement, Hana went on a jaunt through the store, perusing the produce aisle (as her friend Troi has been arguing all these years that cupcakes are basically a fruit, being small and sweet and easy to eat without need for utensils), the candy aisle (as her friend Troi has been sneaking cupcakes into movies for years), the cereal aisle (as her friend Troi eats cupcakes for breakfast), the health food aisle (as her friend Troi says that when you frost a cupcake with green icing, it becomes a superfood, like kale), and the bread aisle (because her friend Troi makes sandwiches by putting deli slices between two cupcakes). Yet to her dismay Hana found the entire store to be bereft of cupcake mix. So as the story always goes, Hana returned to the baking aisle, convinced that amongst the cake mixes she would discover the cupcake mixes. After all, what are cupcakes but mini-cakes, made from the exact same batter that would make a whole cake; a batter, in fact, that is made from the exact same pre-made mix….. and as Hana contemplated this an epiphany came to her. I should let the store manager know that they are all out of cupcake mixes! Thankfully, the manager was out that day, baking cupcakes, and so it was a trusted friend –- not Troi –- that gently broke the news to Hana that the origin of cupcakes was cake mix, and that cupcakes were not given their own mix. Hana digested this information just a bit slower than the average person digests a cupcake. Eventually she accepted it, and bought a cake mix. And in the aftermath of this cupcake calamity, Hana, brimming with indignance over poor packaging and double-crossing designs, phoned a friend, this time Troi, and reported that she had an idea for Troi’s next blog post. Troi considered the story of the cupcake underdog struggling to make a name for himself in the grocery store when he’s been robbed of his own identity separate from his bigger, tougher cousin the cake, and envisioned the hypothetical tourist from Canada and his hypothetical Canadian family on their first trip into an American Safeway, thinking to themselves, “This trip to America would be complete if only we could make some cupcakes, but we just can’t find the mix!” and the resulting discord as the family became divided on an acceptable alternate dessert item, eventually ending in divorce and sad little Canadian children being bussed back and forth on weekends and holidays between their mother who lived in the Undersea Gardens and their father who lived at the Wax Museum (because those are the only two places Troi has been to in Canada, and she lacks imagination), and she was definitely moved toward this compelling concept. But since the cupcake isn’t sentient and common sense crosses cultures, in the end Troi was not sufficiently moved to miss the chance to take a decidedly different take on the story, one that finally featured, but in no way mocked, the travails of a person other than Troi. So, Readers, the next time you find yourself in a situation where you can’t find what you need, remember to think outside the box, and there the solution will be. Unless you’re Troi. She’s still looking. As we prepare for Easter Sunday, it behooves us (because Easter Bunnies have hooves) to remember the reason for the season. There are dozens of reasons—-a dozen to be exact—-to remember what Easter is really about, and each reason is oval with a hard shell, and white until colored otherwise. Some of us may only have eight reasons to remember what Easter is about, after a certain zealousness to boil all twelve eggs at once in an undersized pot led to an eggsplosion (see Troidini & The Great Eggscape for a history of my previous eggsploits), reducing the number of reasons accompanying me to tonight’s egg coloring festivities by four. The practice of coloring one’s Easter eggs dates back centuries, and spans a range of decorating techniques. Etched eggs, for example, can be traced back to Macedonia, and during the etching process the egg is dyed, a layer of wax is applied in a design, and then the egg is bleached to remove the color in all but the waxed areas. Female eggs in particular like to partake in the etching process to maintain their youthful allure, whereas the manly male eggs sometimes request to be decorated in the Ukrainian Krashanky fashion. Krashanky eggs are dyed a bright, solid color, sometimes a brilliant red to symbolize the blood of Jesus on the cross. Perhaps the most popular decorative Easter egg is the Troi egg, which can be identified by its uneven, faded scribbles, usually sketched with a crayola crayon. 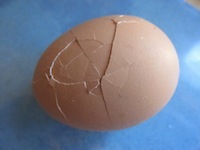 The Troi egg is generally cracked from having been accidentally dropped on the floor sometime mid-scribble, but has been salvaged anyway because the rest of the eggs had been prematurely cracked while undergoing their hard-boiled transformation. Whichever decorative style is your hallmark, the coloring process culminates in the Easter egg hunt. Taking place in an arena that has been digitally manipulated to look like a forest, the eggs are pitted against each other in no less than a race for their lives. Of all twelve eggstraordinary contestants, only one can make it out of the arena alive. Rumor has it that this Easter, there will be an unprecedented change in the rules, and two remaining eggs, if from the same carton, may be victorious. So while tomorrow you’ll be faced at every turn with baskets, bunnies, and Cadbury eggs fronting as the real deal, don’t forget who your real oval friends are, and enjoy your Easter Sunday. Some of you may be familiar with my adopted rescue greyhound, Drifter, but you may not be familiar with his chewing habit. To my human eyes, his myriad chew toys strewn across the carpet are easily distinguishable from my belongings. I wouldn’t, for example, accidentally eat my dog’s squeaky monkey toy, mistaking it for a sandwich. To Drifter, on the other hand, anything lying on the floor or within reach of his tall body is something to be chewed. He sees no difference between squeaky monkey and silky scarf. Of late, he has enjoyed a glove, sock, several undergarments, a tube of lotion, and my favorite scarves, which are now his favorite shreds. As a person who works with children for a living, I find myself saying to him, “Drifter, make a good choice,” which hasn’t seemed to remedy the situation, I think for several reasons. One, he doesn’t understand English, and two, a good choice from Drifter’s point of view is the nearest item within reach of his teeth. Drifter prefers his Proverbs crunchy. So I am newly invested in remodeling the interior of my home by transferring belongings of mine that are in close proximity to Drifter to higher and when necessary, hidden locations. Closets, cupboards, and drawers have become my new friends. And in case Drifter’s keen interest in God’s Little Devotional Book belies an interest in salvation, he and I will be beginning the Bible next week. Let’s just hope he only metaphorically devours God’s Word this time. So my phone rings the other day and when I answer it my friend Hana’s on the line, sounding panicked. “Are you sitting down?” she asks me. Of course I’m not sitting down. I never sit down. I’m too ADD to sit down. “Yes,” I lie, crouching just a little to compensate for my subterfuge. In case you’ve come across this blog not because you’re a close friend who feels obligated to read this post in case I pop quiz you on my recent writings but because you’re a genuinely willing reader of my blog, I should give you the back story on Shelldon. Shelldon was my pet hermit crab last year, intended for permanent residence in my speech therapy classroom, and named after my favorite character on The Big Bang Theory. Due to circumstances beyond my control, Shelldon was unable to remain a classroom pet and I ended up adopting him out to my friend Hana and her son. They have all been a big, happy family for the past year. Shelldon even eats with them at the dinner table, although he prefers crawling across the plate to eating on it. So after she disclosed his death, I opened my mouth to comfort Hana in her time of need. It is usually customary to confirm one’s death before calling loved ones to share the news. I pointed this out in my typically comforting and empathetic fashion. So we attempted to determine whether Shelldon was dead or alive. Basically, here were two adults, one with a bachelor’s degree and one with a graduate degree, which I’m pretty sure equals a doctorate, and we were being outsmarted by a crustacean. Our basic dilemma was Shelldon’s complete absence of movement, which according to Hana’s observations—-which were becoming increasingly unreliable considering the premature eulogy—-had lasted for days. We had to do something that would force Shelldon, if still alive, to move. Which led me to think of the one thing that would motivate Shelldon to book it. So as you reflect upon this story and its relevance (there is none*) to your life during the Christmas season, remember to put a heat lamp on top of loved ones to ensure they are warm enough to come out of their shell this winter. *Really, if you find the relevance here, you’re thinking too hard. I observe that we’ve all been frustrated at Netflix lately, and I know why: It’s that tricky packaging in which they enclose their DVDs. 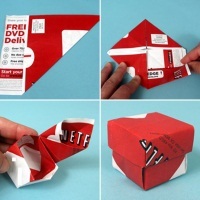 Surely you’ve likewise experienced the dilemma of receiving your Netflix movie in the mail, only to be stumped by the precise points at which you tear, fold, cut, and paste (there is pasting involved, right? ), in order to remove your coveted prize from its package. Before I mastered the art of Netflix DVD extraction, I destroyed the packaging of so many DVDs that I experienced a real fear they’d close my account, with this sort of notice: “You need professional help, or common sense.” And while my account remains open, I’ve heard they recently increased their prices, which is no doubt related to the packaging costs they experienced after I opened my account in May. The price hike, which left all but the top 2% of the world’s movie watchers at a financial crossroads, divided the remaining 98% on the serious political issue of “streaming” versus “DVDs.” And strangely enough, I chose to side with those troublesomely-packaged DVDs, because streaming just sounded too easy. And I don’t know where I would find my excitement if I weren’t scrambling around my condo trying to uncover the DVD sleeve, package, and “that damn DVD I just watched last night, where did it go?” in my own Netflix-inspired version of a mini-scavenger hunt.